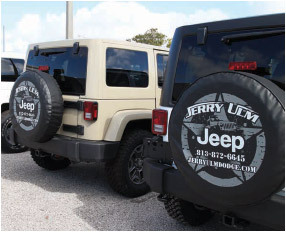 Tag Archive | "Jerry Ulm Jeep"
There are so many great things about owning a Jeep. The community, the quality, the versatility — the list goes on. Another possible addition is the sense of goodwill that seems to extend out to the dealerships — or rather the owners and team at the dealerships — as well. 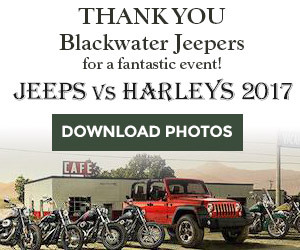 This combination of owners and suppliers makes for a very compelling case to anyone who is not already part of the Jeepin’ community — and those who already belong are probably not surprised. Drei Ulm, general manager at Jerry Ulm Chrysler Dodge Jeep Ram in Tampa, Fla., has been working at his family business since they bought the dealership in 1990. Starting out sweeping the lot, he returned home after attending college to carry on his family’s legacy of conducting business with integrity. “I won the parental lottery between him and my mother. Good, honest people who have always done the right thing. I like to think I do the same,” Ulm says. Jerry Ulm CDJR is now part of the Morgan Auto Group, but the dealership itself has been around since the late ’60s. “They’re wonderful people. About as likeminded as we could be,” Ulm says about Morgan Auto Group. Drei was 7 when his father, Jerry Ulm, acquired the business. He worked his way up from detailing and washing cars in high school to upper management. Ulm has monitored the trends of the Jeep brand over the years, and he is looking forward to seeing the new lineup of trucks and SUVs coming in. The next-generation Wrangler and the long-awaited Jeep pickup truck have very recently been ordered. Ulm is excited about these new developments. The dealership supplies customers with the option of a reconditioned pre-owned Jeep with a rapidly rotating stock of mostly Wranglers. Ulm wants his customers to be confident his team has taken care of these used vehicles as if they were their own. Jerry Ulm was among the first Chrysler dealerships to receive the Customer First Award for Excellence. Speaking to the level of customer service and sales, many team members have been with them for more than 10 years. Drei Ulm says that, if you are looking to have a solid relationship with a supplier, this is the place to do it. Consistency is the best kind of experience as a customer, and these guys have it. The service center is known for holding up these values as well, and again, the expertise in this department has also proven that longevity works. All of the dealership management-level employees have been with them for no less than 12 years. They have continuously kept some of the highest customer service scores in the business center and the country. One of these guys in Ulm’s service department just happens to be Alex Perez, vice president of the Tampa Jeep Krewe. You can read more about his Jeepin’ group and what they are up to in our last issue (“The Growth of a Giving Community,” November/December 2017, Page 12). As Ulm puts it, if you are going to get work done on your Jeep, you want someone who puts their rig through the ringer and understands what needs to be done to keep your Jeep rolling. Drei Ulm, manager at his family dealership, Jerry Ulm Chrysler Dodge Jeep RAM, is determined to provide his customers with an honest service and support before, during and after doing business together. As availability multiplies, dealers are working overtime to help customers sort through all the vehicles, options and terms available to Jeep buyers. When it comes to pricing, the flashy, discounted numbers can catch your eye, but Ulm warns Jeepers to be wary of the experience to follow. He wholeheartedly disagrees with the trend in vehicle advertising that lures you in with a price that has every discount and rebate available tacked on to the advertised dollar amount. The disillusionment settles in once customers realize that many of these discounts are not available to everyone, Ulm says, and in his advertisements, you are seeing what you get. 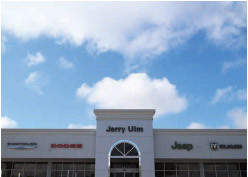 Drei Ulm says you are looking for a new or used Jeep and want a quick, honest and full-service experience, Jerry Ulm Chrysler Dodge Jeep Ram of Tampa is worth checking out. To have anything guaranteed is a lot to ask, but what is clear at Jerry Ulm, is that they will try their best to guarantee you expertise with a great experience.